I'm still not openly embracing fall, but I'm admittedly happy to be seeing my beloved butternut squash at the local farmers markets. Appearing in earnest just a few weeks ago, my pantry now always has a few hourglass shaped squash stashed away and ready for a quick supper. 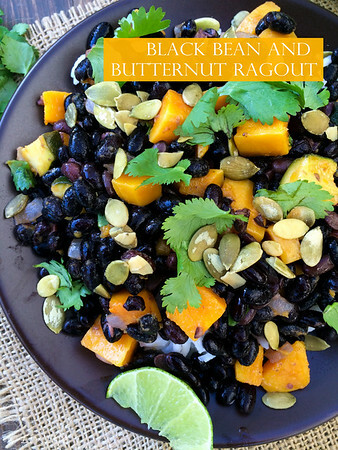 Then along came the most recent Vegetarian Times Magazine in addition to a fabulous Facebook photo with a version of this Black Bean and Butternut Ragout, and I planned this must make meal featuring my butternut. Simple ingredients mix together in less than half an hour, and spooned over prepared rice or quinoa I had a fairly quick, super flavorful meal that appealed to my entire family. Low in calories and with no saturated fats or cholesterol, butternut squash is a rich source of dietary fiber. With more vitamin A than pumpkin, the brilliant hues of the butternut bring high levels of beta-carotene (noted as a deterrent against breast cancer as well as macular degeneration) and a 1-cup serving will give you nearly half the daily recommended dose of antioxidant-rich vitamin C. Add to the mix the fact that the butternut earns its name with its luscious, buttery texture, and we have a true winner. 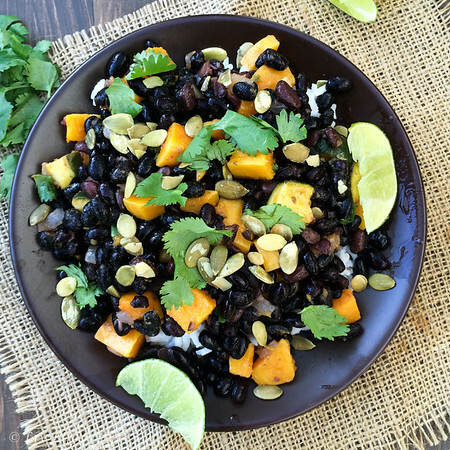 Combined with black beans, onion, and summer squash, then spiced with adobo, a squeeze of lime brought a lovely brightness to this dish. A cilantro garnish tops off the fresh flavors and has this beauty of a bowl just as good the next day for lunch. While fall may or may not be what you are craving now, I can guarantee this butternut dish will ease you into the season. 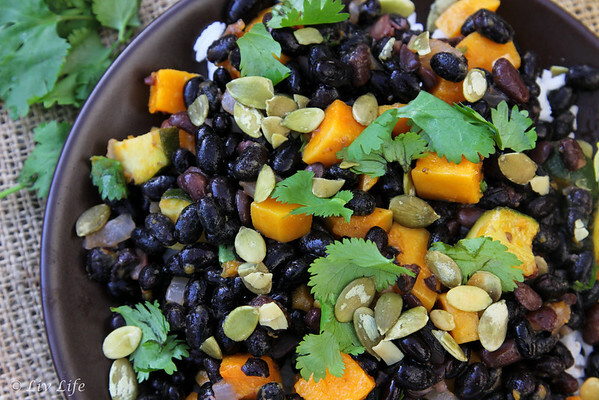 Black beans combine with luscious butternut squash, zucchini and a dash of adobo spice for a bright meal filled with fall flavors. Combine maple syrup and water in a small cup and set aside. Heat the oil in a large, nonstick skillet over medium heat. Add the squash and stir to coat with the oil. Cover the pan and cook about 8 minutes, stirring occasionally. Uncover the pan, add the onion and zucchini and increase heat slightly. Cook a few minutes until the onion and squash are tender and lightly browned. Add the garlic and cook until fragrant - 30 seconds to one minute. Increase heat to medium-high and add the beans and adobo. Add the maple syrup/water mixture and cook until heated through. Simmer a few minutes until liquid is mostly absorbed. Remove from heat and squeeze the lime over. Stir to combine. 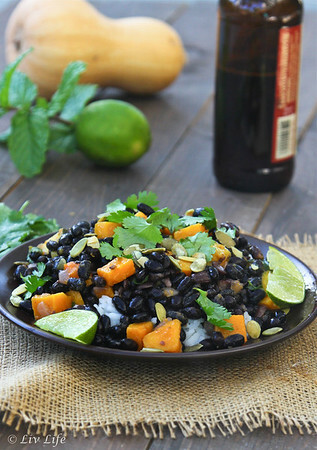 Serve over prepared rice or quinoa if desired, and top with chopped cilantro and peppitas or roasted squash seeds. **Liv Life Note: Butternut Squash seeds can be roasted just like pumpkin seeds. 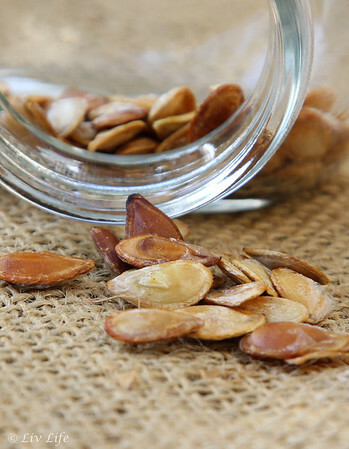 These seeds are nutty and fibrous and contain protein as well as heart-healthy fats. High in fat, they should be consumed in moderation. To roast, separate the seeds from the pulp and rinse with water. Pat dry. Rub lightly with oil and sprinkle with a pinch of salt. Roast lightly in a 200º oven for 15-18 minutes, or until seeds crisp. According to "The World's Healthies Foods" roasting the seeds at a lower temp for a short time can help minimize damage to the healthy oils.